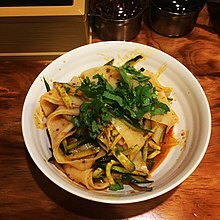 Liangpi (simplified Chinese: 凉皮; traditional Chinese: 涼皮; pinyin: liángpí; literally: 'cold skin') is a noodle-like Chinese dish made from wheat or rice flour. It is a specialty dish originating from the cuisine of Shaanxi Province, but has now spread to many other places in China, in particular the northern and central regions. In northwestern areas of China, it is often called liangpi zi (凉皮子). Although liangpi is served cold, they are served in every season, including winter. Hanzhong Liangpi (simplified Chinese: 汉中凉皮; traditional Chinese: 漢中涼皮; pinyin: Hànzhōng liángpí) or Hanzhong Mianpi (simplified Chinese: 汉中面皮; traditional Chinese: 漢中面皮; pinyin: Hànzhōng miànpí), named for the city of Hanzhong in southwestern Shaanxi, are steamed liangpi with garlic and hot chili oil. Unlike other places, it is often served hot rather than cold. Majiang Liangpi (simplified Chinese: 麻酱凉皮; traditional Chinese: 麻醬涼皮; pinyin: Májiàng liángpí) are liangpi garnished with julienned cucumber and a sauce made of salt, vinegar, hot chili oil and especially Chinese sesame paste, for which it is named (simplified Chinese: 麻酱; traditional Chinese: 麻醬; pinyin: Májiàng). Shaanxi Gan Mianpi (陕西岐山擀面皮 is another type of Liangpi, which tastes a bit firmer and looks darker in color compared to other Liangpi. The process of making Gan Mianpi is quite laborious, including several iterations to separate gluten and starch, by washing the dough in cold water a few times. After washing, mainly gluten is left in the dough, which can be solidified by boiling (called Mianjin). The starch water is thickened by boiling as well, and then spread on a pan and further cooked as a pancake. It is always served with Mianjin (solidified gluten), cooked vinegar, hot chili oil, salt, mashed garlic in water and bean sprout. ^ Moskin, Julia (30 July 2008). "Let the Meals Begin: Finding Beijing in Flushing". The New York Times. ^ "凉皮——详细制作过程教你做陕西风味小吃", meishichina.com, 23 July 2008. ^ Goldberg, Lina (22 February 2013). "Asia's 10 greatest street food cities". CNN Travel. Retrieved 24 February 2013.